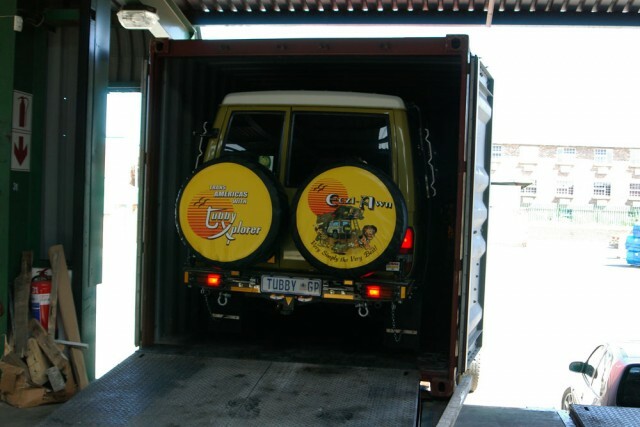 The bare vehicle was brought to Eezi-Awn’s workshop who specialize in the manufacture of R.V equipment e.g. retractable awnings, rooftop tents and aluminum roof racks. Having the vehicle there was an enormous boon. At my disposal was a complete workshop and a sheet metal shop next door that manufactured many metal and aluminum parts I required for the Troopy. 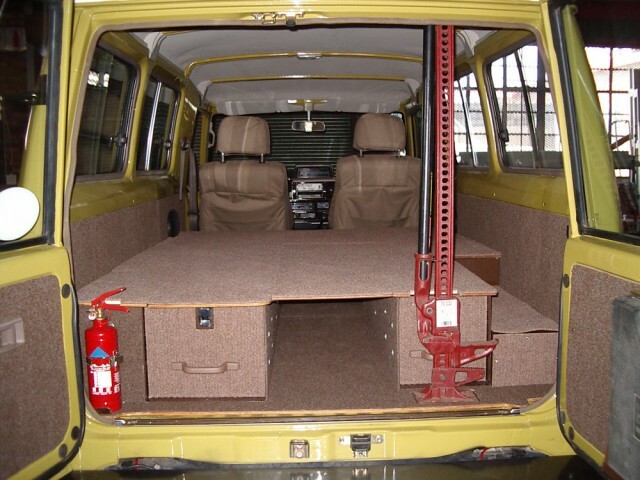 Concentrating on the interior, the first step was to draw electrical wire from up front under the bonnet close to the batteries to various power points in the van – for extension lights, Engel compressor fridge, inverter, etc. This done, the interior of the outer walls of the body were carpeted so that much needed replacement spares such as fuel/oil filters, fan belts, radiator hoses and so forth could be stashed in the body cavities. Storage space was of utmost importance and carpeting these inside walls prevents any damage that may be caused to the outer shell by the stored equipment. On the passenger side at the rear of the vehicle a safe for valuables e.g. cash, traveller’s cheques was built into the body cavity that is hidden from sight once the interior panels were secured in position. After all wiring, outer wall carpeting, and safe had been done, the interior wall panels were carpeted, split horizontally in order to remove the upper portion that provide easy access to the equipment stowed behind. 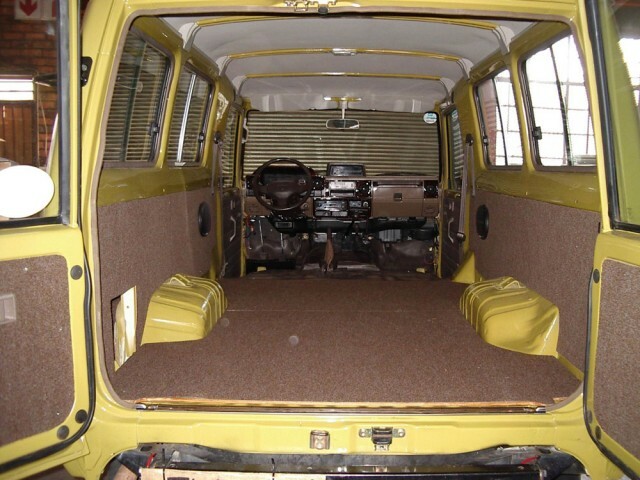 The Troopy comes as standard (stock) with a loosely fitted carpet on a corrugated steel floor which makes it difficult to walk on and for the fixing of various equipment, the loose carpet was discarded and a 8mm plywood board covered with carpet laid as a solid flat base – much better!!!! Starting from the dash “numero uno” was to fit a Pioneer radio-tape, 4 speakers and a 6 CD shuttle – must have music and music should come at the best quality available – never travel without music. A further 2 power points were fitted both ends of the dash – too many is never enough and mini-maglite holders were screwed to the side of the dash, in the gap between dash and doors, within reach – always to hand. Just under the dash on the sidewall of the passenger side next to the door, a fire extinguisher was secured, easy to get at should it be required. Carrying on with the interior equipment, an aluminum roller drawer system was installed with a passage between the drawer housings. Each storage drawer was approximately 1200mm and extremely practical. Beyond the drawers up front towards the front seat, two compartments which were also manufactured of powder coated aluminum assembled either side of the passage for “his” and “hers” clothing. These compartments located directly behind the front seats and to “his” compartment sidewall the CD Shuttle was placed and across the passage attached to the side-wall of the “hers” compartment directly behind the drivers seat a 12 to 220 volt inverter was mounted to provide power in order to charge the laptop, camera batteries and various other equipment en route. Next to it a fairly visible 2nd safe had been bolted. It’s more psychological than anything else especially when you call the bluff of curious authorities who wish to see all and sundry especially what cash you may have on hand – got to fool them some time or other!!! The minimum of cash was placed into this safe and removed when leaving the vehicle. The safe door could be left ajar for all to see that there was nothing inside. 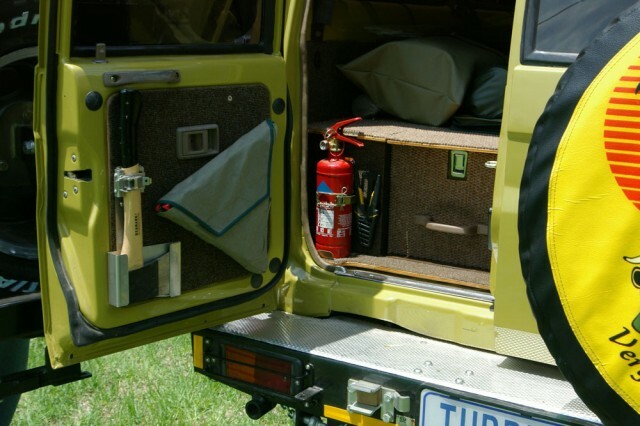 The drawer system ran along the protruding wheel arches that allowed for smaller recesses behind the drawers, creating stowage compartments for tools, recovery kit and fishing equipment. Had to try my hand at fishing South, Central and North American waterways – trout, bass, dorado and whatever decided to take the bait. Can’t spend my days driving – one has to relax now and then. The roller drawer system and compartments are 300mm high and these had been covered with 8mm carpeted plywood. The two clothing compartments were accessible from the top via hinged lids. 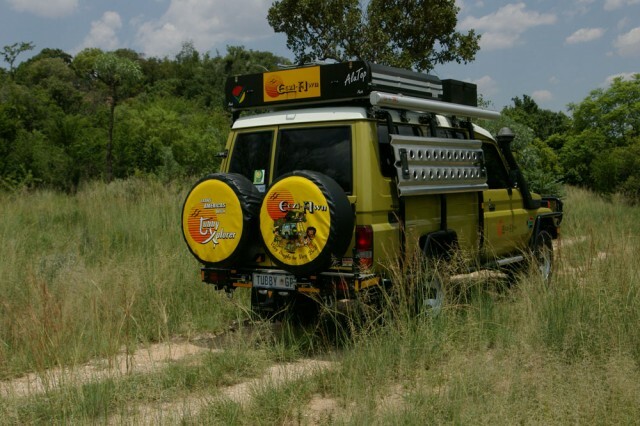 Two centre pieces of carpeted ply fit above the passage to complete the deck with ample space for a two piece mattress and comfortable sleeping – so that we had the option to sleep in the Troopie or in a rooftop tent on top of the vehicle. Viewing the vehicle from the back, rear doors ajar immediately to your right most accessible a pair of very flat folding chairs plus aluminum table and hi-lift jack was stored. My preference was to mount the jack internally – less chance of it being nicked or covered in muck. On the right hand door a light frame supported a very comprehensive tool kit. Immediately to the left a second fire extinguisher was placed and on the carpeted panel of the door safety triangles contained in a pouch were secured with velcro. Next to these fitted in a stainless steel sheath was a handy axe. In planning the layout of the vehicle it is always most beneficial to try and position certain equipment within easy reach in the event that it should be required urgently e.g. hi-lift jack, tools, fire extinguisher etc. Even a feather duster was close at hand. There is quite a story behind the feather duster. Many years ago a friend of mine Charlotte suggested amongst all my accessories a feather duster should be included. My first thoughts were – Is she nuts? Well, these thoughts were unfounded. 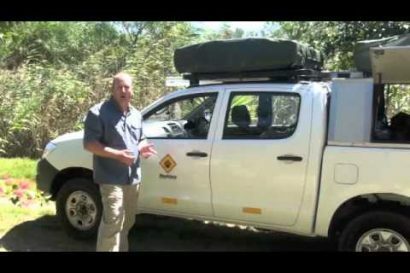 It proved to be one of the best items ever taken along on my various safaris through Africa. Whenever stopping, out came the now dubbed “Charlotte” and first and foremost dust was removed from the rear doors before being opened. What a boon and a marvelous idea. Thank goodness for my “Charlotte”!!!! With the drawer system, clothing compartments, CD Shuttle, safe and inverter intact, the re-covered seats were bolted into position. Three last items to be secured in the vehicle were two hinged ceiling mounted wire baskets for jackets, cardigans etc. To the underside of the smaller basket a metal cradle containing a pressurized garden spray was fitted – marvelous for a high-pressure portable shower. Alongside them, an awning casing to transport fishing rods and last but not least a carpeted shelf for maps and documents above the windscreen. 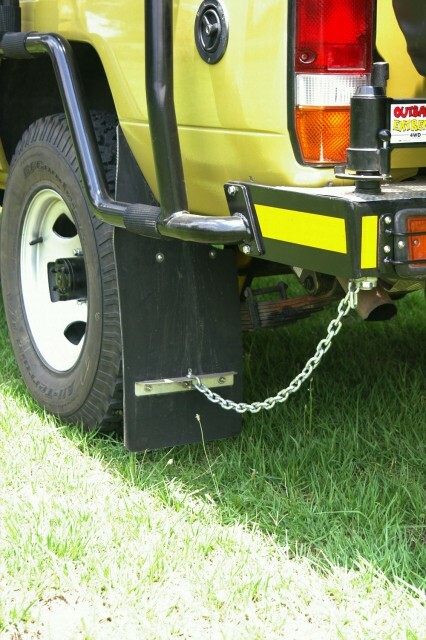 To the vertical upright face of the shelf across the width of the Troopie a hoe handle was fixed with bicycle clips for easy removal. The steel head stored behind passenger seat. Why a hoe?? First of all the handle is easy to store and could be an incredible weapon to defend oneself if need be – makes one think of the movie with Bo Svenson in “Walk Tall” – ha – ha!!! Furthermore local farmers taught me on my Trans Africa trip through Kenya when Tubby One got stuck that the hoe proved far more efficient in removing mud from underneath and around the vehicle than a spade or a shovel. One is able to reach much further under the vehicle, turn the hoe head sideways and pull out lots more unwanted material. Subsequent to acquiring my own hoe it had the same result in thick sand and found it marvelous for digging “pottie” holes – efficiency par excellence!!! With the sun-visors attached and an old aircraft altimeter fitted between the visors to the underside of the shelf the installation was completed. For added security and to prevent burglary should it for one or other reason be loaded as deck cargo e.g. Caracas (Venezuela) to Colon, Panama, we manufactured a lightweight three piece grid (stored under the rooftop tent mattress whilst traveling) which could be installed at short notice should it be required to separate the driver’s cab from the rear compartment where most valuables were kept. This security applies to the engine compartment as well. On both sides of the bonnet two stainless steel wings with 8mm diameter eyes were bolted. These protruded above the bonnet so that a sleeved chain could be laid across and locked in position to prevent the bonnet from being opened and in doing so deny unauthorized access and pilferage of parts or batteries – a necessity – can’t be too careful. 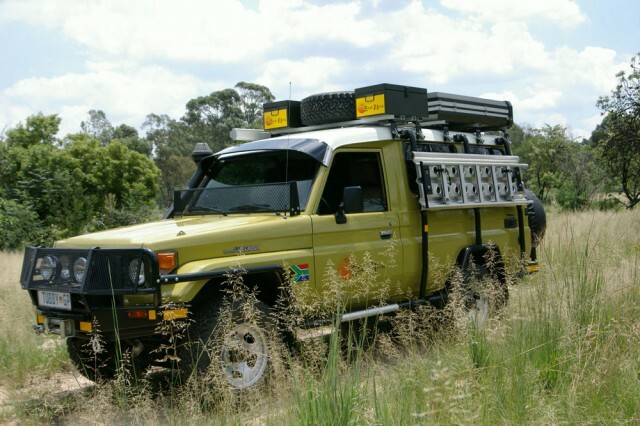 Let’s continue to look at the outside of the vehicle – up front the ARB bull bar, 9000 Warn winch and spotlights have been re-attached since body make-over and over the front grill a removable fly mesh screen was fastened to prevent insects clogging the air conditioner and main radiator cores. 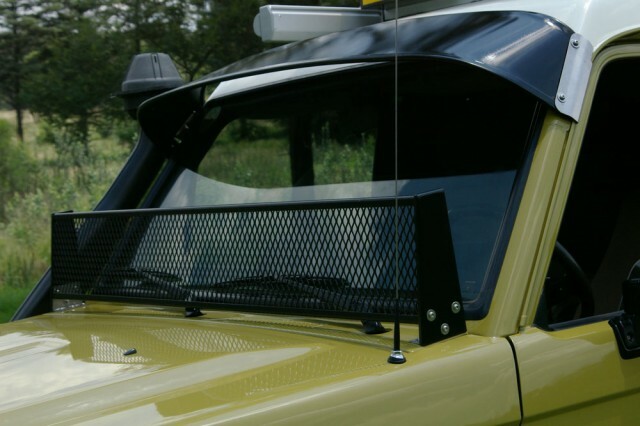 Across the full width of the bulbar an expanded powder coated stone guard was attached with plastic ties to protect spot, head and indicator lights against flying objects e.g. stones. Close up to the windscreen a vertical wire screen approximately 250mm high was installed – this system has worked very successfully in Australia. It is supposed, to a great extent, deflect flying stones from damaging the windscreen especially when it comes to driving the ripio and gravel roads of Patagonia. Installed above the windscreen a sunshade a’la the 50’s and 60’s cars of yesteryear. Under the hood triple mounted batteries – the main separated as sole supplier for motor start-up, the others for all other accessories e.g. compressor, fridge, power points, inverter, spotlights, winch etc. Down under oversized and longer mud flaps were cut from conveyor belting. 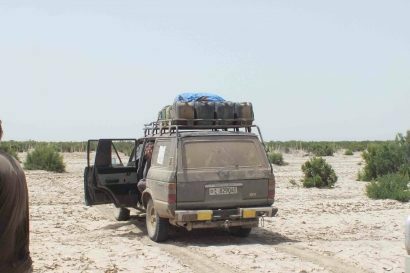 The rear two had chains attached from flap to the rear bumper which prevents the rubber from folding under and torn off by the wheel when reversing in heavy sand or mud. The larger flaps were mainly fitted to protect the bodywork from flying stones on the dreadful South American gravel roads – for this reason the rear shocks were fitted with protective rubber flaps. The mag wheels were discarded and replaced with 80 series Land Cruiser steel rims shod with 265x75x 16 All Terrain B.F. Goodrich tyres. At the rear a heavy steel bumper manufactured by African Outback supporting two swing out spare wheels was bolted into position. In order to protect the vehicle from impact on both sides or from other damage which may occur once loaded onto ferries e.g. Belem to Manaus up the Amazon River a 50mm diameter pipe roll cage was bolted to the bumper and chassis at the bottom and at the top attached to the side of the roof with tiny rubber shock absorbers so that no chassis/motor vibration transmitted through to the actual body and fixed to these pipes two horizontally mounted 1800mm aluminum sand ladders were slung either side which not only prevents burglary but should they be required could be utilized to aid driving out of thick mud, deep sand or covering gaps on rickety South American wooden bridges. It’s not inside – it’s on top. 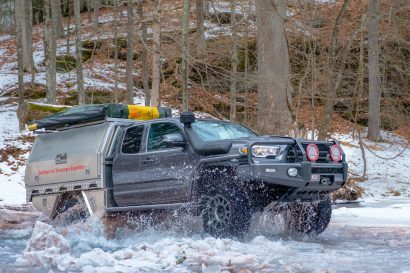 An Eezi-Awn Rooftop Tent, retractable awning and two load bars with a seventh wheel and two storage bins mounted on top of these completed the vehicle ready for the ultimate expedition – The Americas with Tubby Xplorer. In building such a vehicle and organizing such an expedition many fundis were involved – Stuart Baillie in the initial body and mechanical make-over and then Cecil Edwards who as a sheet metal expert manufactured all the bits and pieces that I designed which were required whether for the interior e.g. aluminum drawer systems, roof trays etc and under the bonnet triple battery tray, hot water geyser and compressor bracket and the list of additional plates and brackets virtually ad infinitum. Then there was the procurement and manufacture of all of the equipment on top. 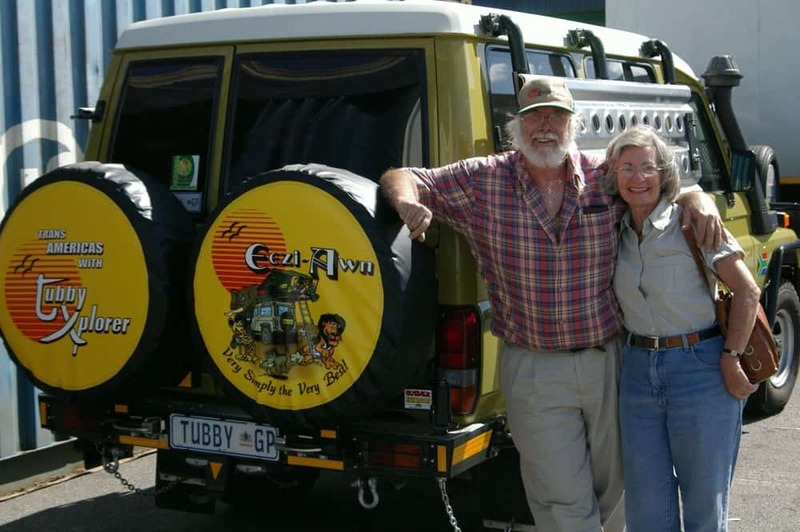 My family, son, daughter and son-in-law who run Eezi-Awn saw to the completion of Tubby Xplorer. Then last but not least Margaret, my soul-mate and traveling companion, who has seen to all paperwork re visas, medical requirements, inoculations, insurances, carnet etc and of course putting up with all my idiosyncrasies. Margaret and all the fundis, my mates, were absolutely marvelous in the preparation for the intended expedition. In conclusion there are most probably many sceptics who when reading this article would say – “Goodness!! aren’t you overdoing things. Did you really need all those goodies attached to the vehicle?? ?” Well, from my point of view having traversed Africa south to north and gaining invaluable experience on such an Odyssey it was preferable to travel one hundred and ten percent prepared, even for any event which may never occur, than go with a half-cocked vehicle and brave the consequences and aberrations which are inevitable. After all nobody in his right mind is out there to look for trouble but rather to feel free and confident that his/her wheels will get them there and just a little further, and hopefully with the least problems which may occur – obviously sod’s law will always prevail!!! Stay tuned for more stories from Tubby Xplorer!